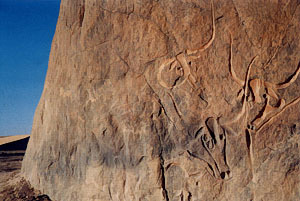 The great rock art panel of Tan Zoumaitek features the Big Horn (Oudad) that is the logo of Tassili National Park. 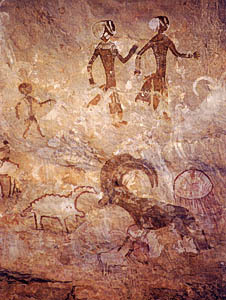 The fine group of superimposed paintings also features two female dancers, a jellyfish, additional big horns (included a stylized one with the horn curving in the opposite direction), a camel with rider, and more. See ALG-8 and ALG-145. 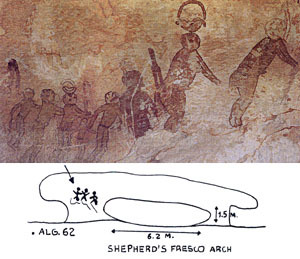 8,000-year old painting on the side of Shepherd's Fresco Arch, ALG-62. 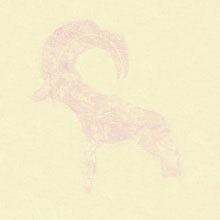 If you like both rock art and arches, you will love Tassili! 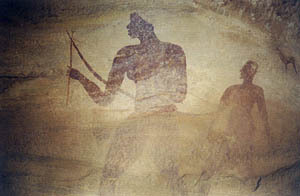 The Archers of Tin Aboteka, found on the rock art trail in the Tin Aboteka Area. This exceptionally large image is 1.8 meters high. The Black Lady (La Dame Noir) in the Sefar Area. 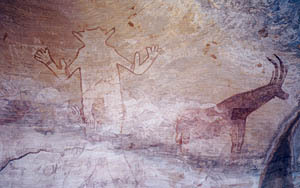 The Great God of Sefar, on the rock art trail in the Sefar Lower Maze Area. See ALG-143. 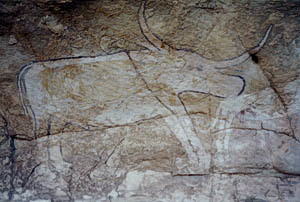 Bovidae rock art in Tin Aboteka. The Crying Cow engraving (La Vache qui Pleure). See ALG-68. 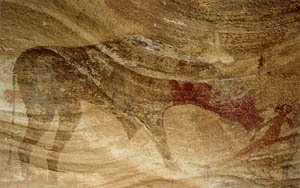 Bovidae Painting in the Sefar Area. The location of this rock art in Tin Kani Area is shown on Map 7 (lower right, marked with blue arrow).